The /r/Codes message board on Reddit is one of my favorite sources when I write posts for this blog. 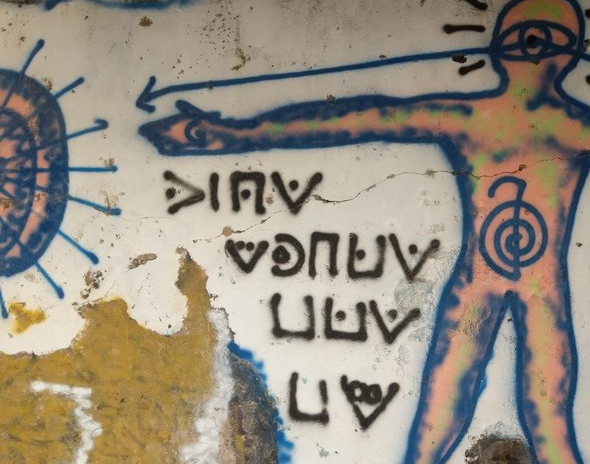 Earlier this week, a Reddit user named brenda842 published a message about an unsolved encrypted graffiti that had the appearance of a Pigpen cryptogram. 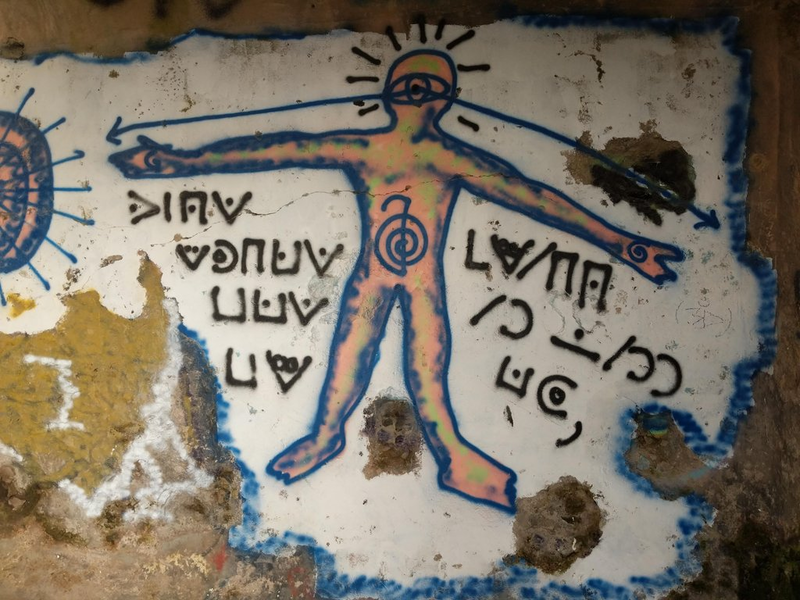 As it turned out, the same graffiti had already been introduced on the /r/Codes board a few months before (but is escaped my notice). As far as I can see, the solution is still unknown, although a user wrote “solved” in a comment on the first Reddit post. It is hard to say if this transcription is correct. There might be an additional blank space between LM and NLMM. In addition, it is not clear whether the comma-like symbol at the end is really a letter (it could also be a punctuation mark). Pigpen cryptograms are usually created with a simple substitution cipher (MASC). My guess is that this is also the case here. Usually, MASC encryptions are easy to break (at least for many of my readers, who are known as great codebreakers), but this one might be a little more difficult because it is quite short (26 letters). In addition, the plaintext language is not known and the transcription is not necessarily correct. Assuming that the transcription is correct, the ciphertext word LMNLMM is a good candidate for a word pattern search – a six letter word with the first and the fourth letter being equal as well as the second, the fifth and the sixth letter being equal is quite rare. 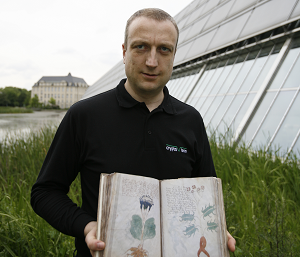 However, a search with CrypTool 2 revealed that this pattern is not only rare, but even non-existent among the common words in Italian, English, and German. Can a reader solve this crypto mystery? If so, please leave a comment. Further reading: Who can decipher these two diary entries? @Nils: Thanks, this looks correct. This means that there is actually a space between LM and NLMM. And 8cht posted a solution “spia vedra tra to mondi”. No sorry, this does not make any sense in either Italian or any Italian dialect (there are plenty of them, but I am pretty sure of what I’m saying). Further proof of Google Translate’s unreliability. MENTO (= “I’m telling lies”), STO ( = “I stay”, or, in rapid speech, “this”), SU ( = “on”) and AL ( = “at the”) are indeed Italian words, but the whole sentence is gibberish. Normally, the pigpen has two 9-digit grids and two 4-digit grids, with and without points respectively. This one seems to use many more different grids (with two points, two circles, circular with & without points, slashes etc.) so that the whole diagram must be far bigger than 26 letters. Unlike the “first time” attempt, the “Spia vedrà” thing might have some merit, in spite of its problems. “Spia vedrà tra to mondi” is not correct standard Italian, but in a Northeastern dialect might mean “(A/the) spy will see between your worlds” which might be related to the drawing. However, the last words resist transcription, and it is unclear what a Northeastern motto is doing so far South (a tourist writer, perhaps?) I’m far from convinced. If Dario is correct, this cryptogram is still unsolved. Can a reader find out more? @Simon: Absolutely. I’ve been thinking of that too. It’s probably not a coincidence that the very strange pattern LM-LMM consists entirely of non-standard-pigpen characters. ABCD EFGHD IHD IJ KJLGC LMNLMM HOP with a possible space before N, and P, N and even L candidates for interpunction.